This bike (if you can still call it that) has been chained to this sign for as long as I have been in Savannah, which is about two weeks. I guess if I were the owner I would leave it there too. Not much good anymore. 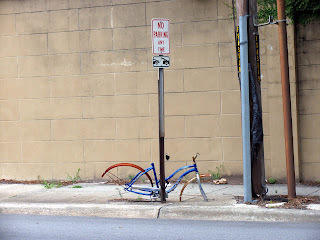 Probably serves as a reminder to other people not to leave their bike out. Or maybe it's an art sculpture. Savannah is home to a college of art and design.